TME has supplemented its offer of hot air soldering stations with a new SOLDER PEAK product. 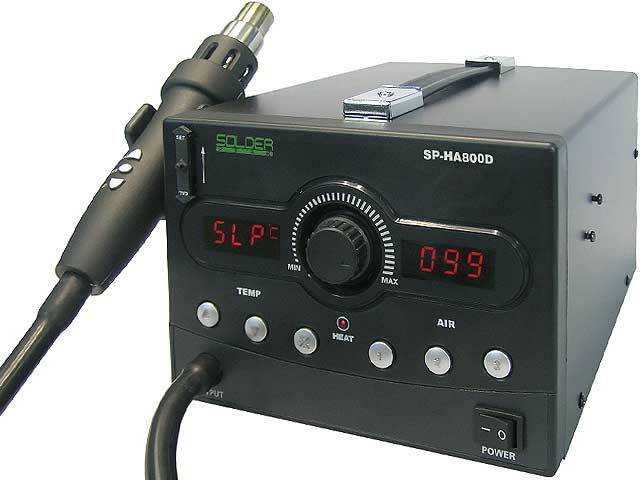 It is an up-to-date SP-HA800D digital soldering station. It has 800W power, which in conjunction with maximum temperature of 500°C enables operation with large assemblies and PCBs, while maintaining very good temperature stability. Ergonomic handle has been equipped with buttons that enable operation parameters change. Two LED displays serve for temperature display and for hot air flow range display as well as for other menu functions display. The station has three operating programs. It is equipped with a sleep mode, thanks to which automatic heater cooling is carried on after putting the soldering tool off onto a stand. There is also a possibility of temperature calibration. SP-HA800D is an excellent tool for service shops and for prototype and job-lot production.